11th June 1776, East Bergholt, Suffolk, England. 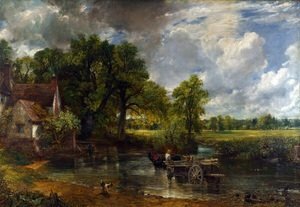 Constable was the son of a wealthy mill owner. 1794: Constable worked for a year in his father’s mill but the wealthy landscape painter and art patron Sir George Beaumont encouraged his family to send him to the Royal Academy Schools. 1802: He exhibited his first painting at the Royal Academy. 1819: Constable elected Associate of the Royal Academy. 1824: He had a success at the Paris Salon with “The Haywain” winning a Gold Medal. 1825: Gold Medal success at Lille with “White Horse”. 1828: On the death of Constable’s father-in-law he inherited £20,000 and was able to devote himself entirely to landscape painting. 1829: Constable elected Full Member of the Royal Academy of Arts. His style particularly encompassed the changing light on a landscape and the movement of clouds across the sky. His later years were saddened by bereavement, ill health and depression but he continued painting, although many of his landscapes went unsold. 1816: Maria Bicknell, Died 1827. 31st March 1837, London, England. St. John’s Churchyard, Church Row, Hampstead, London, England. Museum and Art Gallery, Leicester. Lady Lever Gallery, Port Sunlight, Wirral. The Graves Art Gallery, Sheffield. Glynn Vivien Art Gallery, Swansea.